The past several weeks saw the Hou Hsiao-hsien Retrospective come and go in Seattle, and I covered it in detail over at Seattle Screen Scene (I also was lucky enough to be invited to introduce a handful of shows as well, which was fun). Over there I wrote lengthy reviews of The Boys from Fengkuei, The Time to Live, The Time to Die, Dust in the Wind, Flowers from Shanghai, Millennium Mambo and Café Lumière. I also covered the Seattle releases of Abel Ferrera’s Welcome to New York, Hal Hartley’s Ned Rifle and Lisandro Alonso’s Jauja. I also submitted an annotated list of Underrated 1985 Films to Rupert Pupkin Speaks. And I don’t think I’ve mentioned it yet, but I also have a thing on my favorite Film Discoveries of 2014 over there too. Over here at the end, I wrote about Chang Cheh’s Masked Avengers, part of my Running Out of Karma series, the index for which is fully updated. I’m closing in on 200 Chinese language films seen as part of the series, which is surely some kind of a milestone. Especially since I still pretty much hate the series’s title. My other indices are up-to-date as well: the Review Index as well as the Index of Essays and Podcasts. These are the movies I’ve watched and rewatched over the last few weeks, and where they place on my year-by-year rankings. Running Out of Karma is my on-going series on Johnnie To, Hong Kong and Chinese-language cinema. Here is an index. Masked Avengers was released in 1981, the latest in a series of films directed by Chang Cheh and starring a new group of actors and stunt performers generally known as the Venom Mob, after the 1978 film in which they were first gathered, The Five Deadly Venoms. The plot revolves around a martial arts group’s search for the leaders of a criminal gang of assassins. The bad guys wear masks, conduct elaborate sacrifices of their victims (including blood-drinking) and are surprisingly hard to find considering they’re the only other characters in the film. Except for one guy, a waiter who knows more than he lets on, who turns out to be a hero, which is also pretty obvious because he’s played by Philip Kwok, the most-recognizable of the Venoms (you know him as the badass killer from Hard-Boiled and also Johnnie To and Tsui Hark’s The Big Heat). Like the rest of Chang’s films from this period, the plots and characters are rote and mechanical, the fight scenes interminable and the sense of moral, cultural and philosophical decay overwhelming. They are bloody, bleak and crushing films, movies in which the heroes who in earlier years stuck defiantly to codes of honor and brotherhood are finally lost into their nihilistic world of violence and destruction. Chang Cheh’s breakthrough films in the late 60s and early 70s are driven by the star charisma of David Chiang, Ti Lung and Jimmy Wang Yu and romantic notions of brotherhood, codes and bloody self-sacrifice (The One-Armed Swordsman, Golden Swallow, The Duel, Vengeance!, The Heroic Ones). His mid-70s films reflect a haphazard attempt to chart a history of kung fu (driven in some part by his collaboration with Lau Kar-leung), locating that code ideal in a centuries-old tradition, as well as an influx of new stars like Alexander Fu Sheng and Chen Kuan-ti (Shaolin Temple, Boxer Rebellion, Five Shaolin Masters, Heroes Two). His late 70s and 80s films ditch the romanticism of brotherhood and movie stardom in favor of a collective of highly skilled stunt performers, almost all of whom either lack star power or aren’t given a chance to express it in the confines of the claustrophobic gothic-detective narratives in which they find themselves. The films (In addition to Masked Avengers, I’ve seen The Five Deadly Venoms, Crippled Avengers, Ten Tigers from Kwangtung and Five-Element Ninjas) almost all exist outside of history or even the ephemeral political context of so many other kung fu films (Ten Tigers being the notable exception, as it is located on the Shaolin Temple-Wong Fei-hung timeline, about which I wrote a long piece last year that may be published someday) choosing instead to play out as either generic revenge tales or wholly unremarkable mystery plots. This has the effect of making the films seem even more nihilistic than Chang’s earlier paeans to bloody revenge. At least when David Chiang is sacrificing himself, he’s doing it for something. Even Wang Yu’s white-clad super-swordsman in Golden Swallow, alienated from the world by his bloody obsessions, at least has his moment of heroic glory, knowing he’s the greatest warrior of them all. The early Chang heroes die standing up, but in the late films, there’s no such glory to be found, only exhaustion. Driven by the percussive rhythms of their (over-)long fight sequences, which, without the drive to authenticity of Lau or the comic ingenuity of the New Wave of choreographers popping up at Golden Harvest and various independent production houses (Sammo Hung, Corey Yuen, Ching Siu-tung, Yuen Woo-ping) become exercises in brutality. The films become less action-entertainment than Sisyphean horror shows, the human body distorted beyond reality, mutilated and scarred by motiveless betrayals and the devious machinery of violence. The five venoms and ninjas are inhuman collectives, the avengers are crippled and demon-masked. The infernal dungeons and torture devices of Masked Avengers belong more to the world of Roger Corman’s Poe films than the bright studio sets of the Shaw Brothers (contrast Chang’s spare but for devilish implements of murder backgrounds to the stately Sternbergian clutter of Chor Yuen’s wuxia films of the same period (Heaven Sword and Dragon Sabre, Heroes Shed No Tears, and The Sentimental Swordsman), the ornateness of his mise-en-scene matched only by the wild curlicues of his and Gu Long’s dizzyingly complicated plots, narratives which pack more ingenious twists into any given ten minutes than the entirety of Chang’s bland mysteries). The Masked gang utilizes statues of the Buddha in its elaborate torture systems, imprisoning their victims within statues or crucifying them upon them, but they don’t propagate an alternate religion: their base is an abandoned temple, their world has no monks, no ideology, they kill people for money and that is all there is. The kung fu film in the early 80s, like most generic cycles in their late stages, was falling apart as it dissolved in a multitude of directions. In a weird way, Chang, the oldest of the great kung fu directors, most captured the generational rage and nihilistic drive to (self-)destruction at the heart of New Wave classics like The Happening or Dangerous Encounters – First Kind. 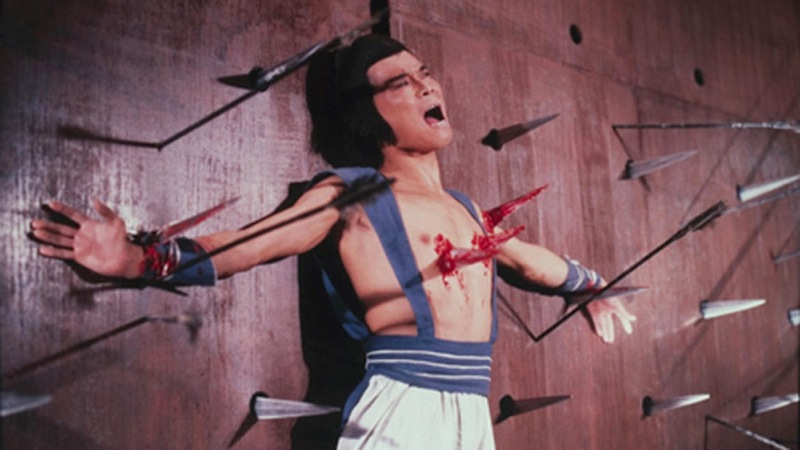 Masked Avengers embodies a bleakness that Sammo Hung can only hint at, that Tsui Hark ventured into only rarely before receding into the comic antics of Cinema City, that Lau Kar-leung took a breath-taking stab at in The Eight-Diagram Pole Fighter before walking away. In the 15 years between 1967’s The One-Armed Swordsman and 1982’s The Five-Element Ninjas, Chang Cheh directed somewhere in the neighborhood of seventy films. I’d hesitate to say these late films represent a kind of personal exhaustion, but my God, who wouldn’t be tired after all that?